Take this unit out for your next family adventure! Model 2800QS has a kitchen perfect for cooking up your favorite meals and cleaning up afterward. The living area has dual opposing slide outs keeping the floor plan nice and open for your time away. The booth dinette and sofa can both fold out for some sleeping space at night for your guests and provide a place for relaxing, playing games or enjoying each other's company throughout the day. As you head toward the rear you will find a walk-through bathroom with a private toilet area and sink along one side of the motor home. 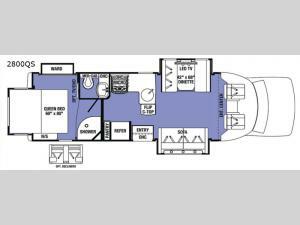 The Forest River Sunseeker Grand Touring Series motor home class C has a tasteful style and design. The backup camera will come in handy when parking your RV into your campsite. The inside of these motor homes are comfortable, very spacious, and there are several floor plans to look at and choose from. There are beautiful colors to choose from that will make you feel like you are at home. All of the Sunseekers are "Certified Green" by TRA Certification.